In future designs of people's environment, there is the need of collaboration of creating disciplines such as architecture, landscape architecture, design, communication and marketing as well as so-called supporting disciplines such as applied computer science, digital media and game development. A concept / idea can be communicated through images and more and more through the interactive participation of people. The interaction of content (creating disciplines) and digital application (supporting disciplines) is crucial. The dovetailing of design and computer science is also growing in regard to future design and co-design processes in the living environment of humans. Incubator participants could develop a great contribution of application-oriented interdisciplinary solutions / services / products for the design of the human environment. The technical infrastructure of the AR/VR Lab offers opportunities to try out, to learn and observe the effects on humans and their environment, and to develop project ideas from these observations and conclusions. The Hybrid AR-VR Lab offers opportunities for beginners, advanced and professionals in the field of media and visualization. Project- and start-up ideas for the mass market (B2C) as well as for special sectors (B2B) can be supported. User studies can be conducted in cooperation with the ego.INKUBATOR User Experience and Resilience. Projects can be supported by various departments of Anhalt University of Applied Sciences. 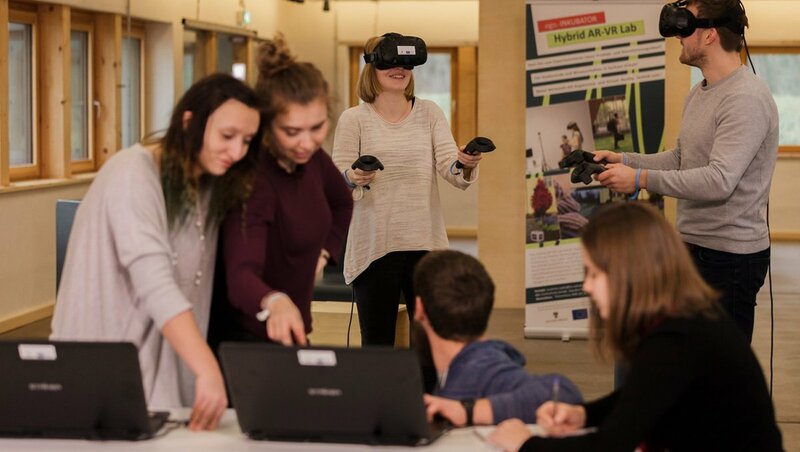 We are an interdisciplinary team and the Hybrid AR-VR Lab was developed in cooperation of various consultants from the different departments at Anhalt University of Applied Sciences. In this way, we can cover a wide range of Start Up related questions and project ideas from different areas of expertise in the field of augmented-, mixed- and virtual- reality- technologies. For developing project ideas / evaluating a StartUp idea or by generating a final thesis topic feel free to contact us. Participants who are interested in AR- & VR- Technologies and the motivation to explore the chances and possibilities in their own field are very welcome. Talk to us, we'll support you! Here you get a theoretical introduction to the topic of virtual, augmented and mixed reality technologies. The differences between the different technologies will be presented and current areas of application will be shown. Here you will also find all information about the AR/VR experimental workshop (location, possible uses, equipment) and information about further workshops and events. Interested to join? Check 'Dates and News'. Here is a practical introduction in the form of various workshops. Among other things, basic knowledge of Unity is taught. The workshops offer a first orientation to self-study in order to make you want more. Check 'Dates and News'.